Why Should You Try Turnips? The potassium and fiber content of turnips make them an effective at helping to lower blood pressure, which in turn reduces risk of atherosclerosis, heart attack, and stroke. The fiber in turnips also promotes good gut health and may help improve digestion. Turnips contain vitamin C and ascorbic acid, which boosts the immune system the boost for the upcoming winter. One half cup of turnips accounts for 15% of the daily recommended amount of vitamin C.
The combination of vitamin C, vitamin E, manganese, and beta carotene found in turnips gives them an antioxidant effect in reducing inflammation. 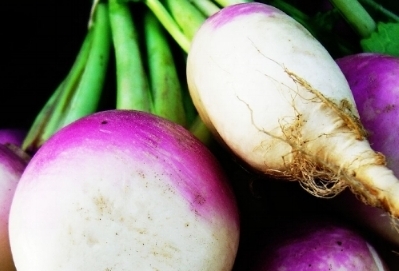 Turnips are low in calories, fat, and sodium. ½ cup of turnips counts as a serving of vegetables, and they are a tasty way to add to the 2 ½ cups per day of vegetables that is recommended for most individuals. How Do You Prepare Turnips? At the store or farmers’ market, look for turnips with smooth skins and crisp green tops. The bulb of the turnip should be white on the bottom and purple on the top. Smaller turnips will be sweeter, so those are the best option if you plan on eating them raw. Wash the turnips under warm water with a vegetable brush. Peel the turnips if you prefer them that way. Cut off the greens and use them separately if desired. Slice, dice, chop, or leave the turnip whole. Boil in water for 20-30 minutes. If desired, mash them as you would with potatoes. Microwave with a few tablespoons of water for 6-9 minutes. Remove from microwave and let them sit covered for 3 minutes. Add to soups, stews, salads, casseroles, or whatever dishes you would like! Preheat oven to 400 degrees. Place peeled and cut turnips, carrots, and Brussels sprouts onto a large sheet pan Then drizzle with olive oil and sprinkle with salt and pepper. Toss together. Bake for about 25 minutes, turning half way through. Remove from oven and toss with balsamic vinegar. Top with cranberries and enjoy. Watch the Live Cooking Demo on Turnips with Ruth Lahmayer Chipps on Thursday Dec. 20 on WEAU-TV 13(NBC-TV Eau Claire, Wis).